Did you miss out on the Windows 7 public beta and want to try it out before you actually make the leap and upgrade? Maybe you want to learn how to deploy new features in a business environment. 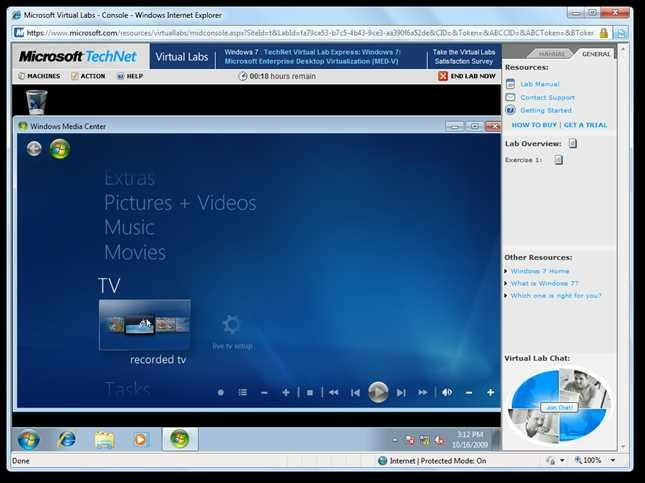 Here’s how you can test drive Windows 7 directly from your browser. Whether you manage 10,000 desktops or simply manage your own laptop, it’s usually best to test out a new OS before installing it. If you’re upgrading from Windows XP you may find many things unfamiliar. 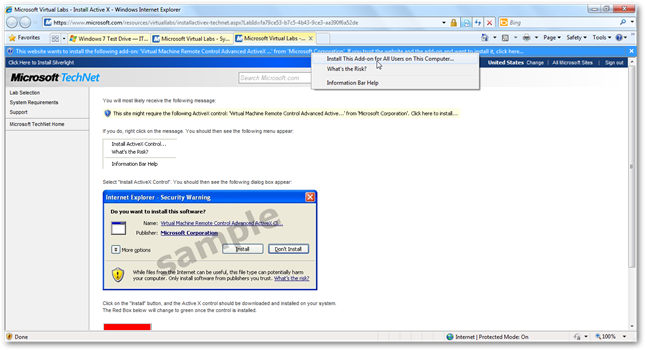 Microsoft has setup a special Windows 7 Test Drive website with resources to help IT professionals test and deploy Windows 7 in their workplaces. This is a great resource to try out Windows 7 from the comfort of your browser, and look at some of the new features without even installing it. 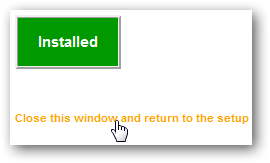 Please note that the online version is not nearly as responsive as a full standard install of Windows 7. It also does not run the full Aero interface or desktop effects, and may refresh slowly depending on your Internet connection. 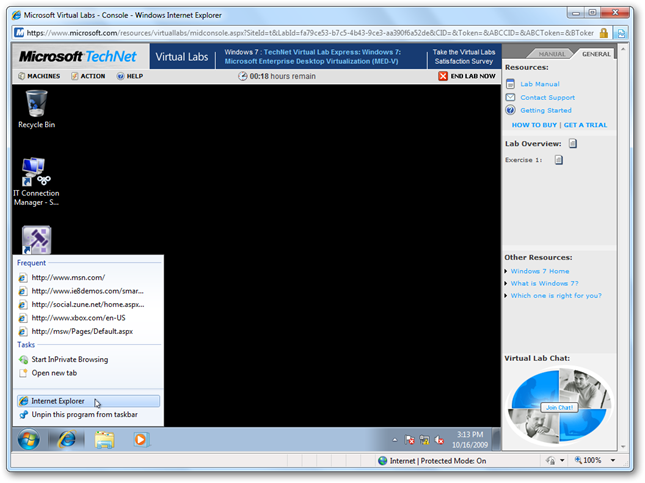 So don’t judge Windows 7’s performance based on this virtual lab, but use it as a way to learn more about Windows 7 without installing it. Now, click the “Take a Test Drive” link on the bottom left of the page. 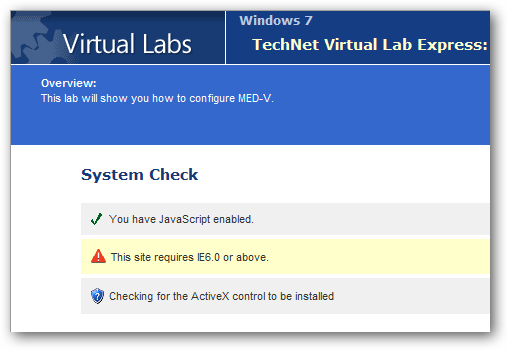 If you haven’t run a Windows test drive before, you will be asked to install an ActiveX control. Click the link to install. Click the yellow bar at the top of the page in Internet Explorer, and select to Install the add-on. You may have to approve a UAC prompt to finish the install. Once this is finished, click the link on the bottom of the page to return to your test drive. The test drive page should automatically refresh; if it doesn’t, click refresh to reload it. Now the test drive will load the components. Once its fully loaded, click the link to launch Windows 7 in a new window. 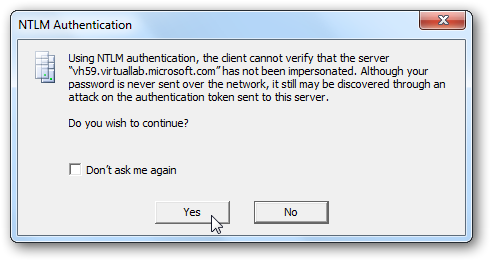 You may see a prompt warning that the server may have been impersonated. Simply click Yes to proceed. 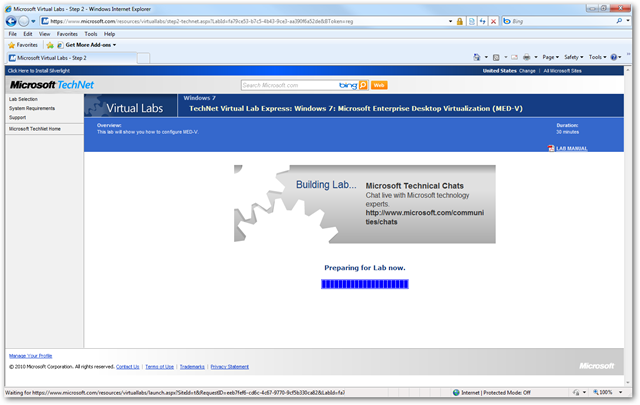 The test lab will give you some getting started directions; click Close Window when you’re ready to try out Windows 7. Here’s the default desktop in the Windows 7 test drive. You can use it just like a normal Windows computer, but do note that it may function slowly depending on your internet connection. 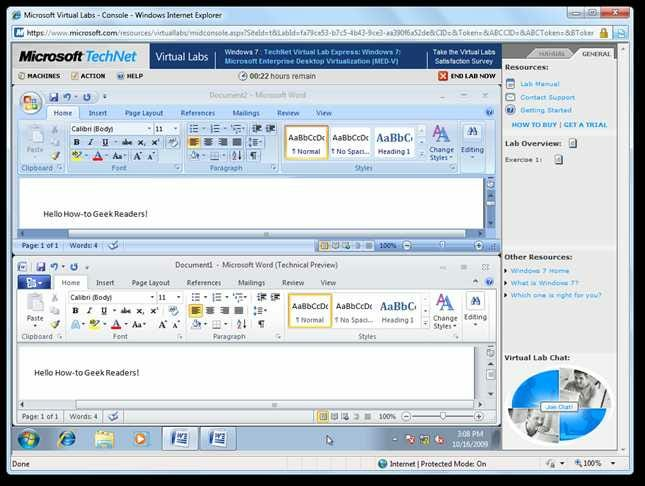 This test drive includes both Office 2007 and Office 2010 Tech Preview, so you can try out both in Windows 7 as well. 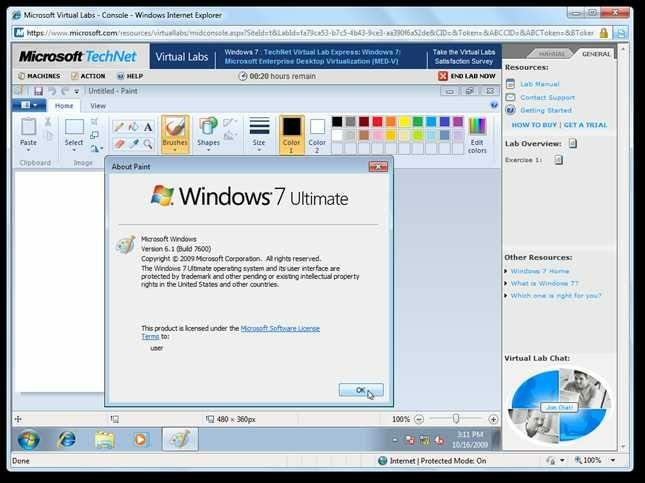 You can try out the new Windows 7 applications such as the reworked Paint with the Ribbon interface from Office. Or you can even test the newest version of Media Center, though it will warn you that it may not function good with the down-scaled graphics in the test drive. Most importantly, you can try out the new features in Windows 7, such as Jumplists and even Aero Snap. Once again, these features will not function the quickest, but it does let you test them out. 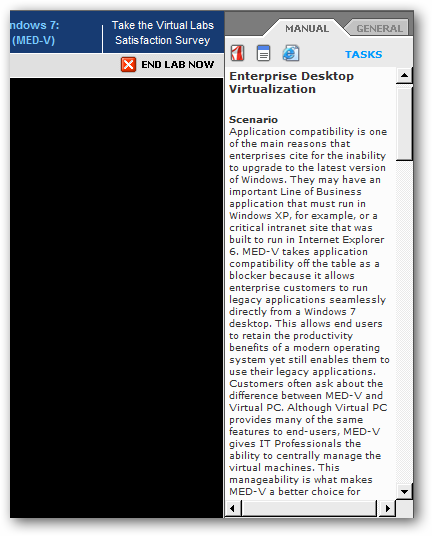 While working with the Virtual Lab, there are different tasks it walks you through. You can also download a copy of the lab manual in PDF format to help you navigate through the various objectives. 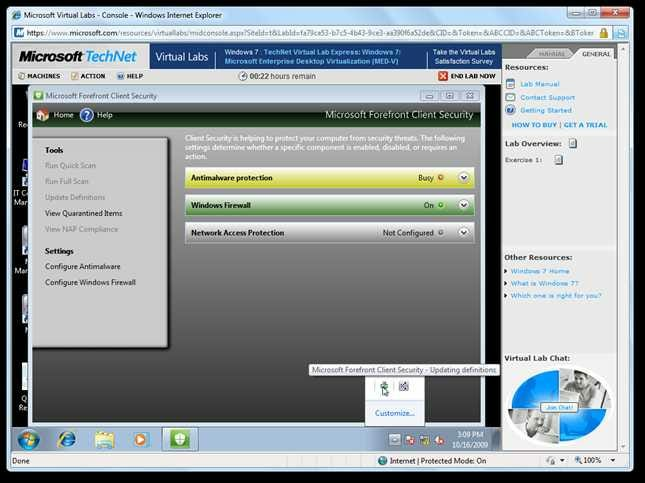 The test drive system is running Microsoft Forefront Security, the enterprise security solution from which Microsoft Security Essentials has adapted components from. 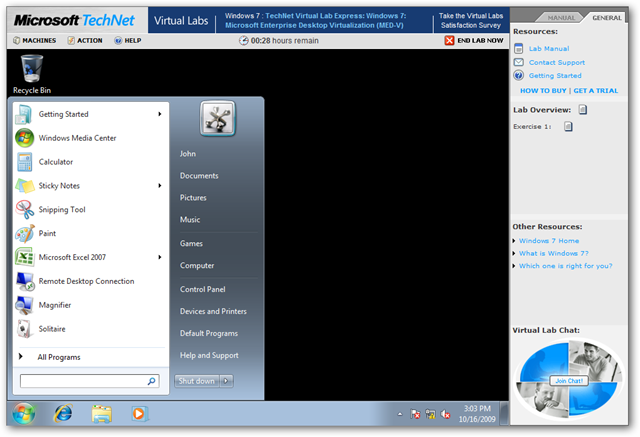 These virtual labs are great for tech students, or those of you who want to get a first-hand trial of the new features. 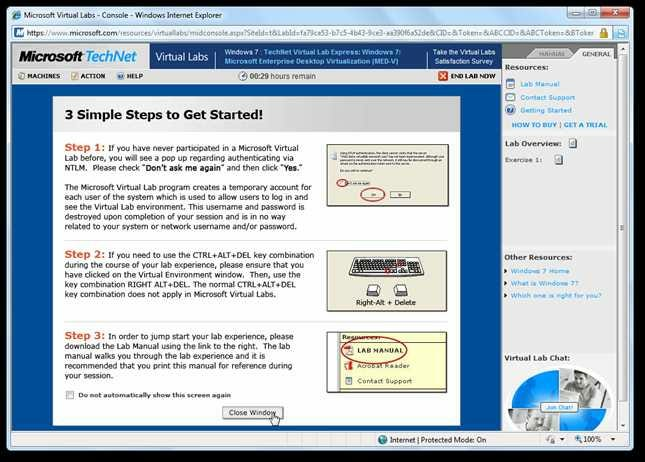 Also, if you’re not sure on how to deploy something and want to practice in a virtual environment, these labs are quite valuable.While these labs are geared toward IT professionals, it’s a good way for anyone to try out Windows 7 features from the comfort of your current computer.